This 360-degree view shows one of Opportunity´s last stops on the surface of Meridiani Planum before reaching different terrains associated with the very large Victoria Crater. In the center of the mosaic is Beagle Crater, an impact crater about 35 meters (115 feet) wide. 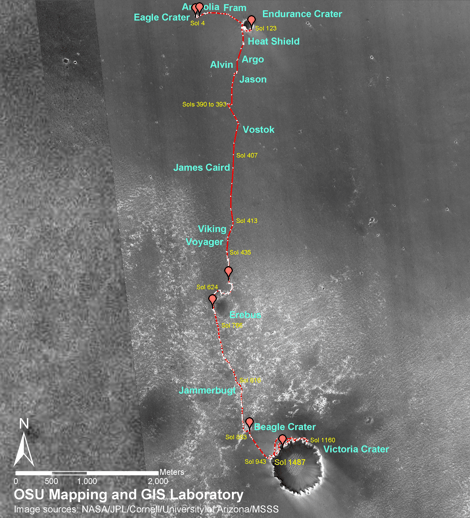 On the far left and wrapping around to the far right, Opportunity´s tracks are visible approaching the crater. Though it looks relatively fresh in orbital images, from a closer vantage point Beagle Crater appears moderately eroded. The crater walls are slumped and the middle of the crater bowl is filled with rippled sand. However, a slightly raised crater rim remains, and in a few places (for instance, on the inside left wall), cliffs of outcrop appear to be preserved in the crater. Ejected rocks from Beagle Crater surround the rover, many with the distinctive, fine-grained layering commonly seen in the rocks of Meridiani Planum. Many of these rocks have surfaces smoothed by wind erosion. Wind erosion also formed the sand drifts nestled among the rocks. Beagle Crater takes its unofficial name from a great ship of exploration, the HMS Beagle, whose most famous passenger was British naturalist Charles Darwin. During the Beagle expedition around the world, Darwin conducted many of the observations that led to his theory of natural selection. Scientists have unofficially named many rocks and features in the area of Beagle Crater after the Galápagos Islands and the varieties of finches Darwin observed there. The name Beagle Crater also commemorates the ill-fated British lander, Beagle 2. Opportunity took the mosaic of images that make up this 360-degree view of the rover´s surroundings with the panoramic camera on the rover´s 901st through 904th sols (6 August through 9 August, 2006) of the mission. This is an approximate true-color image combining exposures taken through the panoramic camera´s 753-nanometer, 535-namometer, and 432-nanometer filters.